A woman seeks to make the outdoors more accessible for fat people – just as they are and without shame. Armed with her slogan “Trails Not Scales”, she soon finds herself hosting events all over North America. When you picture an avid hiker, images from REI and MEC commercials come to mind: this person is often able-bodied, white, thin, and decked out in the latest outdoor gear and sporting equipment. But what about fat people? Hiking is an activity perceived to be out of the reaches of fat folks and other marginalized groups. This belief remains despite the social emphasis on weight-loss and fitness that often targets those who live outside the norm, especially those who inhabit bigger bodies. Fat Hiking Club challenges this assumption. 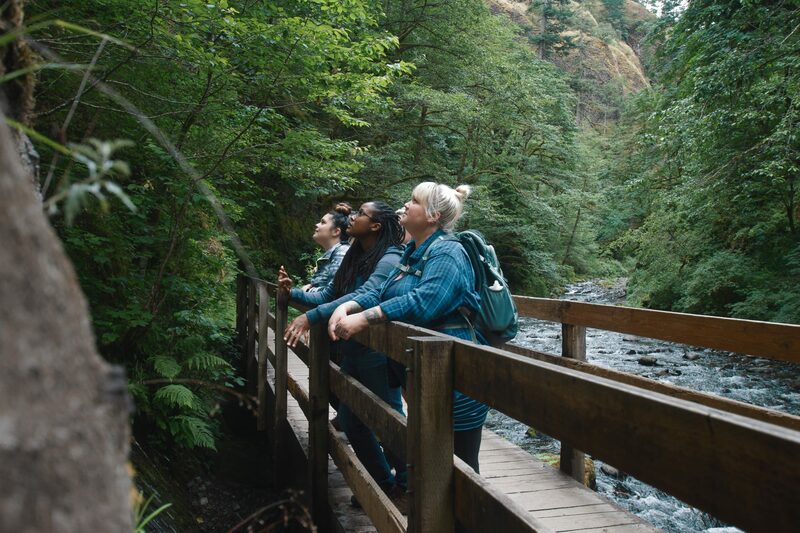 This short documentary film captures the story of Summer Michaud-Skog, the founder of Fat Girls Hiking, an organization based in Portland, Oregon. Summer’s mission is to make the outdoors accessible for everybody – and every body. Her organization quickly grows in popularity, inspiring her to take it internationally. First stop: Vancouver, British Columbia. Layla Cameron is a queer fat activist, filmmaker and PhD student living in Vancouver, British Columbia. Fat Hiking Club is her first film. You can find out more about Layla and her work on her website. Danie Easton is a visual artist based in Vancouver, British Columbia. With a passion for storytelling, they produce cinematic works on a variety of subjects through their production company Eastowest Productions. I moved to Vancouver from Toronto largely to indulge in the beauty of the Pacific Northwest and to try to climb some mountains. Shortly after arriving on the west coast, I read yet another article advocating that hiking is an excellent way to stay or become thin, and that all ‘good’ Canadians should take note. Considering myself already a halfway-decent Canadian, I quickly added this rhetoric to the steadily growing pile of flaming fatphobia that fuels my involvement in body politics, and began looking on social media for other fat hikers who shared my enthusiasm. After stumbling upon Fat Girls Hiking, I decided that this subject would make an excellent documentary film. I hope that this film inspires you to find an activity that makes you feel good in your body – whatever that may be and whatever that may look like. We will be at the Vancouver International Women in Film Festival on March 8th as part of the Perseverance Furthers shorts program. Join us for the screening and the post-film Q&A! Tickets available here. We’ll be at the No Man’s Land Film Festival in September! More details here. Our European premiere will be at the London Feminist Film Festival on August 19th! Tickets are available here. Our world premiere will be at the Vancouver Queer Film Festival August 17th as part of the Coast is Queer program! Tickets are available here.